When you refer a patient to a dentist, it will help if you can describe the specific location of the problem. To do that you must use the proper terms to describe the location, identification, and surfaces of the teeth. Since this does not occur frequently, we will not take space here to cover it. This information is available in detail in Dental Assistant, Basic, NAVEDTRA 10677. Dental anatomy deals with the external form and appearance of the teeth. Dental histology studies the tissues and internal structure of the teeth, along with the tissues that surround and support them. A knowledge of dental histology will be helpful when you provide emergency dental treatment. 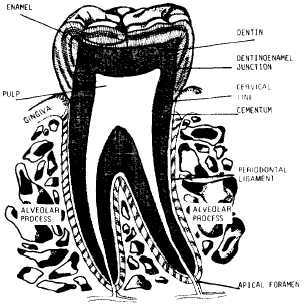 Structurally, the teeth are composed of four different tissues: enamel, dentin, cementum, and pulp. They are shown in figure 2-5 and are discussed below.